Are you one of the millions of Americans who is missing teeth? In addition to a few missing teeth affecting your self-esteem and your ability to talk properly, missing teeth can also damage the health of your dental arches, putting the rest of your teeth at risk. Fortunately, dental implants can recreate the look, feel, and function of natural teeth. 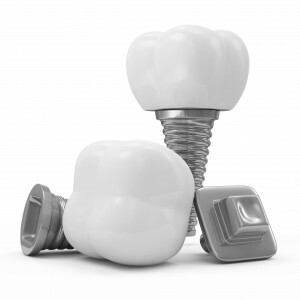 Dental implants are supported by a small titanium post that is anchored into the jawbone. Over time, these implants fuse with your natural bone, creating a strong, stable support system for your new tooth. Here are just a few of the incredible benefits of dental implants in Westchester County, and how Advanced Dentistry of Scarsdale can improve your smile. Appearance: Unlike bridges or dentures, which can look unnatural to the naked eye, dental implants are independently supported and customized for your smile, creating a completely natural look. Confidence: Because dental implants are firmly supported by your bone tissue, you won’t have to worry about slippage, dental adhesives, or bad odors from accumulating food debris between your denture and your palate. For this reason, dental implants allow people to talk and chew confidently. Healthier for your Smile: Unlike dentures and bridges, which can place extra strain on your teeth and gums and ultimately lead to bone loss, dental implants help to strengthen your dental arches, warding off bone and tooth loss. Dental implants recreate the natural stimulation your teeth create with your jaw tissue, which helps to keep your remaining teeth strong and healthy. Lifespam: Dental implants have an extremely high success rate and can last a lifetime with proper care and maintenance. Although the initial cost of dental implants is higher than other tooth replacement options, implants are cost effective because they last so long. Simple Care: Dental implants are easy to take care of. Unlike dentures, which have to be removed and sanitized daily, dental implants simply need normal checkups, and daily brushing and flossing. If you are thinking about dental implants in Westchester, don’t trust your teeth to anyone other than a periodontist. In addition to receiving years of extra formal training regarding the diagnosis and treatment of gum disease, periodontists also study the placement and care of dental implants extensively. Periodontists, such as the experts at Advanced Dentistry of Scarsdale, can help you to achieve the smile of your dreams. Want to know if you are a candidate? Call Advanced Dentistry of Scarsdale today to know if you are a candidate for dental implants in Westchester.